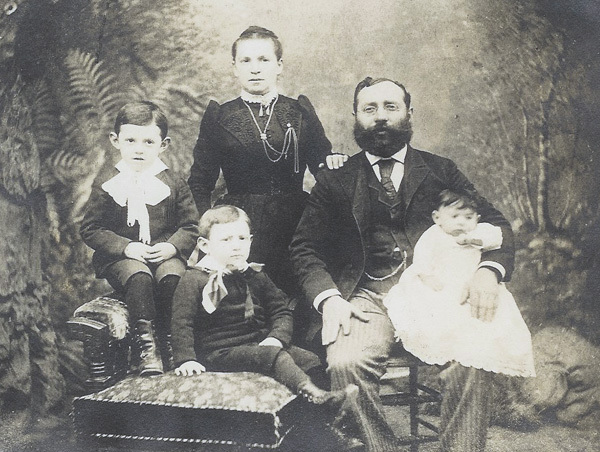 Leah and Jacob Pushkantser with thier children Ese, Bob, and Celia in 1892. Jacob was my g-g-grandfather, born in Rumshishok (Rumsiskes), Lithuanian region of Russia. He was the first Pushkantser to come to Albany, NY. Art's grandmother was from the Marcus family. There are also collections of old photos, reunion photos and documents. This Poskanzer Family Tree is the result of a collaboration between Arthur Poskanzer and Olga Zabludoff. It was originally based largely on information provided by Samuel (Sonny) Poskanzer and the late Stanley (Corky) Poskanzer, both of Albany, NY. Olga Zabludoff obtained many records from the Lithuanian State Historical Archives. The Rosenberg branch was supplied by Marjorie Bloomberg Tiven, Jane Frueh, and Elaine R. Collins. The Kanzer branch came from J. Michael Gilbreath, with a large addition from Andrew Kanzer. Max Pushkantser in St. Petersburg, Russia has been very helpful with extensive research in Russia and translations from the Russian. Max and his daughter Olga supplied the Ukraine branch. Also, Julia Pushkantser from Israel and Anna Khelemsky from Philadelphia added information on their Ukraine branches. None of this could be possible without the generous web hosting at acme.com provided by Jef Poskanzer. Other people who helped were Arthur’s parents, Bunny Kor Aberle, Mordecai Alpert, Avi Anouchi, Marcia Anouchi, Melanie Bone, Elaine Brody, David Bruck, Esther Carden, Liz Carden, Pam Hankin Carver, Naomi Charnov, Beth Cohen, Cindy Fine Cohen, Ed Cohen, Harriet Cohen, Elaine Rosenberg Collins, Hillary Tiven Corn, Danny Crooks, Danica Davidson, David S. Davidson, Harold Davidson, Josh Davidson, Joan Dinowitz, Ruth Dinowitz, Jerry Eisner, Leo Eisner, Mike Eisner, Howard Figowitt, Ina Fine, Sunny Fink, Jane Frueh, Sarah Fuller, Shelley Gliedman, Lisa Peshkin Godfrey, Alla Goldstein, Stan Grayson, Jose Gutstein, Jim Halpert, Saul Halpert, Eric Hankin, Myra Harris, Gilda Harrison, Harriet Howard-Borenstein, Lisa Poskanzer Harris, Dennis Kambury, Ilya Kanevskiy, Lena Kanevskiy, Andrew Kanzer, Bill Kanzer, Chuck Kanzer, Dave Kanzer, Glen Kanzer, Michael Kanzer, Robert Kanzer, Omry Kaplan-Feuereisen, Bill Kaye, Jezra Kaye, Lori-Nan Kaye, Neil Kaye, Shirley Kaye, Ann Kelleher, Lisa Kor, Raina Kor, Harriet Kronick, Andrew La Bella, Bernice Peshkin Lebowitz, Abby Lotwin, Abbey McLeod, Kate Nachman, Judy Nisenholt, Bernice Peshkin, Beth Peshkin, Alan Poskanzer, Alisa Poskanzer, Barbara L. Poskanzer, Barry Poskanzer, Charles Leo Poskanzer, Charles Newton Poskanzer, Dan Poskanzer, Debra A. Poskanzer, Debra S. Poskanzer, Elcy Poskanzer, Eric Poskanzer, Ethan Poskanzer, Jason Poskanzer, Jay Poskanzer, Jen Poskanzer, Joe and Mary Poskanzer, Judy B. Poskanzer, Lee Poskanzer, Lisa Poskanzer, Linda Poskanzer, Mark Poskanzer, Mike Poskanzer, Richard Poskanzer, Sally Poskanzer, Sara E. Poskanzer, Steve G. Poskanzer, Susan R. Poskanzer, Alex Pushkanzer, Arkady Pushkantser, Leonid Pushkantser, Oleg and Natalia Pushkantser, Vladimir Pushkantser, Andrey Pushkantsev, Boris Pushkanzer, Christopher Ries, David Rosenberg, Ed Rosenberg, Ingrid Rosenberg, Barbara Rozinsky, Connie Rudnick, Jean Rudnick, Anna Tiven Sachs, Howard Schlenker, Stuart Shikora, Abby Smuckler, Lionel Spiro, Melodie W. Tegay, Hillary Tiven, Rachel Tiven, Sara Tiven, Sally Tuchman, Alex Volinsky, Sherry Poskanzer Wainger, and Frances Zaimoff. Photographs were provided by Marcia Anouchi, Yoel Anouchi, Judy Poskanzer Bartenbach, Harriet Borenstein, Elaine Brody, David Bruck, the Cardens, Naomi (Ostroff) Charnov, Elaine Collins, David Fine, Ina Fine, Larry Freund, Jane Frueh, Michael Gilbreath, Jose Gutstein, Ilya Kanevskiy, Glen Kanzer, Jezra Kaye, Anna Khelemsky, Alan Poskanzer, Corky Poskanzer, Mark Poskanzer, Sally Poskanzer, Sonny Poskanzer, Susan Poskanzer, Boris Pushkanzer, Max Pushkantser, Oleg and Natalia Pushkantser, Dave Rosenberg, and Ed Rosenberg. In the tree a single asterisk indicates that the person appears more than once with different spouses. A double asterisk indicates a marriage of first cousins where the part of the tree which would be duplicated has been omitted. A slash mark between two names indicates alternate spellings. Parentheses surrounding a name indicates either the formal version of the name, a nickname, or a change of name. The entry “cens.” indicates information from either a real census or other dated document. In the e-mail addresses “@” has been replaced by “_at_” and “.” by “_dot_” to protect people from spam. The numbers after the names are clickable source references listed on the sources page. If you have any corrections, additions, or comments please contact me at the address below. In July 2015 Arthur Poskanzer handed the reigns of managing our tree to Lisa Poskanzer Harris.